Today, 27 February 2014, the ETF Civil Aviation Section (ETF CAS) President and Political Secretary attended an action against anti-social practices of low cost companies. 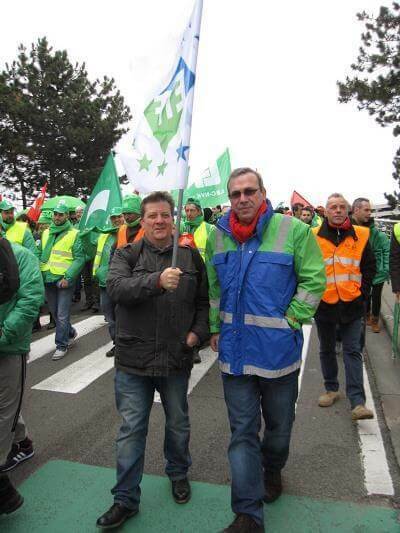 The demonstration was organized by major Belgian trade unions CSC, CGSLB and FGTB on the occasion of 1st day of operations of Ryanair at Zaventem and attended by over 400 participants. The main claims of the workers’ side are the following: all companies having a home base in Belgium and in particular at Zaventem Airport have to apply Belgian labour laws (including social security and working conditions) and Belgian sectoral social agreements. They need to develop a proper social dialogue with the trade unions at company level and sustainable employment policy aiming to keep and create decent jobs. François Ballestero, the ETF CAS Political Secretary, added “The upcoming elections to the European Parliament are also a chance to ask the politicians to include the issue of respecting national labor laws into their programme. But Belgium does not have to wait for Europe to protect its workers. The Belgian government can act at national level and adopt legislation protecting workers, such as the French ‘social decree’”. This decree from 2006 stipulates that any airline having a home base in France has to apply French social and labor legislation, including the respect of collective agreements. The concerned unions announced further actions if necessary.